I have a thing for amusement parks. I like them. Not “freaky” like them, but I like a good roller-coaster, I enjoy a great theme ride and to walk around a place that has happiness written squarely across its business idea. Liseberg, the local amusement park of Gothenburg, opened in 1923, the last time we celebrated a big anniversary for the city. Unlike most amusement parks I’ve visited, Liseberg is super green. It really is a park. I’ve been to Six Flags (no offense) stateside and they’re mostly concrete and pavement. Same can be said about the park in Stockholm. Liseberg is small by comparison to the big American parks, but there are flowers and trees everywhere. So even if you just go for a stroll, you’ll feel relaxed. When I first moved to Sweden, I had barely set my foot in an amusement park. I was sold and for years, I bought a season ticket and spent many a weekend day there, on the rides, eating in one of the many restaurants or going to a concert. But yeah, after twenty years, there aren’t enough news to keep you entertained. When our son was born, things changed. Suddenly, we saw the park through the eyes of the newborn (the fluffy green bunnies, the park’s mascots were the highlight), the toddler and now the five-year-old, who is so tall that he can already go on many an adult ride. Liseberg has a special area solely for children, with special rides just for kids and a playground, unlike anything you’ve seen before. It’s spectacular. They even have special bathrooms for moms to breastfeed and dads to change diapers. This IS Sweden, after all. Some of the best roller coasters in Europe, the world? This year, a new roller coaster is opening, joining three other rides. The new beast is called Valkyria, and you can already go on the ride, virtually. It is in an area of the park which is inspired by Norse mythology, hence the name of the ride. Next door is a wooden roller coaster which has been voted best in the world. On the hill that separates the park from the city are two more roller coasters, Helix (trust me, it’s amazing) and Lisebergsbanan, the oldest of the coasters, but a fun ride for the family. My son absolutely loves it. Roller coasters are fun, but there are a lot more rides in the park, including a log ride, floats, a free fall with Sweden’s best view etc. But Liseberg prides itself to be a park for everyone, and there are plenty of restaurants with good food, from fast food, seafood to buffets and a quirky restaurant that resembles a train station where you eat in train wagons. 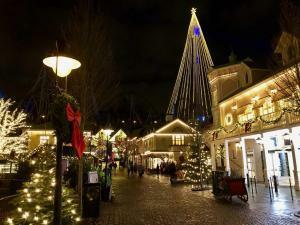 Many in the older generations visit Liseberg just to walk, or why not dance? There’s a large dance stage with weekly concerts for people to dance to. 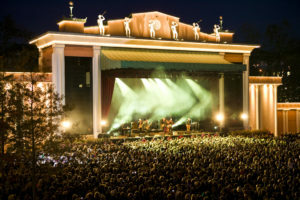 Liseberg also has a big main stage and once you’ve paid for the entry fee, all concerts on all stages are included, for free. Great names have played there, including my personal favorites, ABBA, through the years. You can find this year’s concert program here. 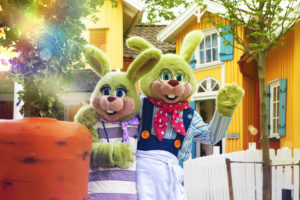 Liseberg opens next Saturday, April 28th for the summer season which lasts until early October. They reopen for a three week Halloween stint (the decor is stunning) and then again in mid-November for Christmas. The park is closed from January to late April. When you come to Gothenburg, and you like amusement parks, make sure to add Liseberg to your itinerary. What’s the best time to visit? An overcast day I’d say, although you’ll find the longest lines, too. Early in the week or early/late in the season work, too. PS: This post was not solicited or paid for by Liseberg. I really like the place. Previous PostPrevious Gothenburg Tours: Spring is in the air, or is it?